Last year I was caught horribly unaware by the cold weather. Of course, I knew winter was coming (it does come every year), but I didn't realize how little warm clothing I actually had in my wardrobe until I really needed it. I ended up making do and shivering through a lot of the season when I should have been enjoying it! What do I need that I can sew? I thought about last year and the things I complained about. I looked through the clothes I still have and wrote down the gaps. Currently, I really need the items listed above. Next, What do I have on hand? 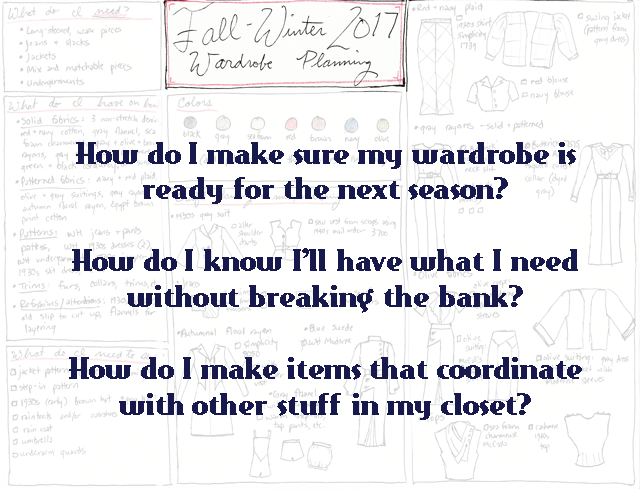 What things do I already have in my stash, notions, accessories, and in my pattern collection that I can use for the upcoming season? I found some fur trims I've never used, as well as a lot of solid fabrics and some patterned fabrics I can use. 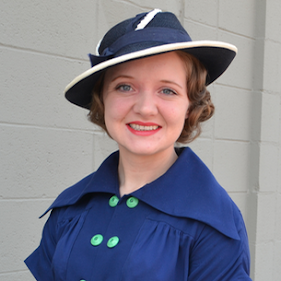 I also marked down items that I would wear more if they were altered, mended, or refashioned. After this, I then considered what I needed to buy to finish these sewing projects and fill in my wardrobe gaps. I need a couple patterns, some accessories, and some wet-weather gear. Knowing all of this helps me budget out the finances and plan when to buy which items. I can also keep an eye out for sales and deals when I know for sure what I need to be looking for! Now for the fun: What colors do I want to use? I want my fall and winter wardrobe pieces to kind of mix and match, to coordinate enough that I have some options. I picked the colors above because, obviously, I like them, but also because they were repeated in fabrics in my stash. I pulled out the fabrics with enough yardage and a coordinating color and put the others back for another time. This pairing will help an autumnal dress transition to colder weather. I made sure to pick a pattern that would look good under the sweater for just that reason! And this is the part that brings it all together! 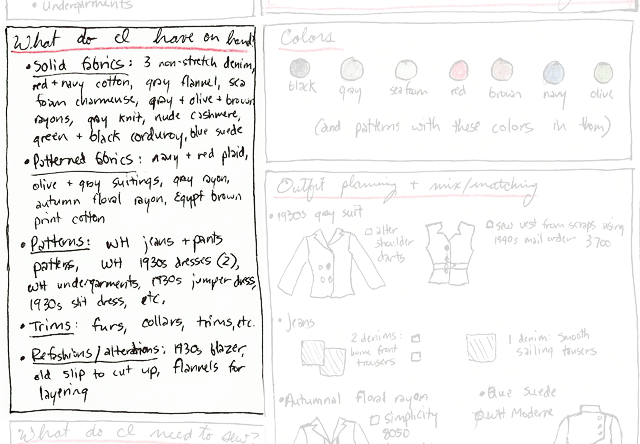 I looked at the things I need, the patterns I have, and the fabrics I've got to work with. 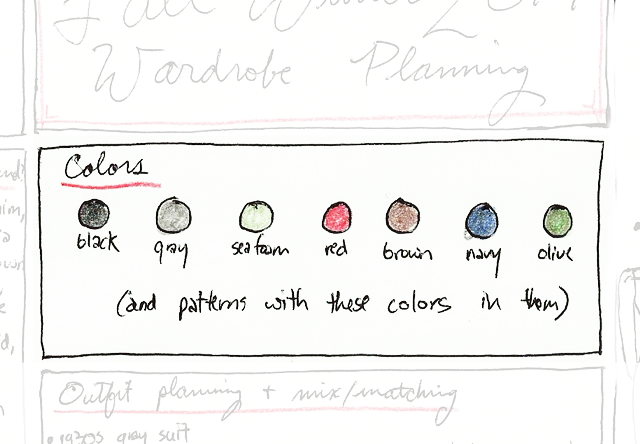 I began pairing fabrics with appropriate patterns, making sure there's enough yardage. I also made a point to use patterns more than once for several items. This makes the sewing a lot more efficient! 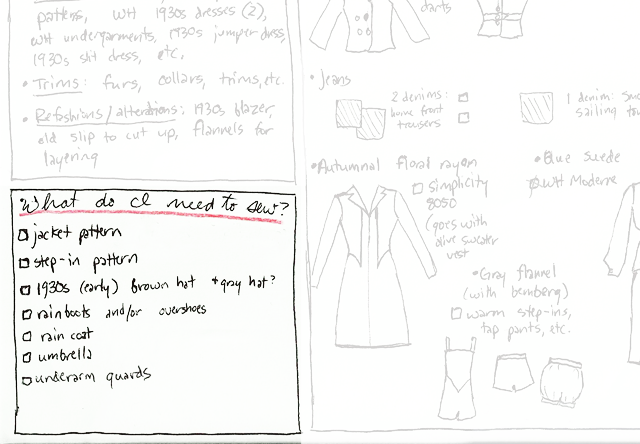 I know this is an ambitious list, but I like having options on what to make while also knowing the pieces I do end up making will work for my wardrobe in the long run. Then, for the last step I prepared with something I'll need for every single project: measurements! 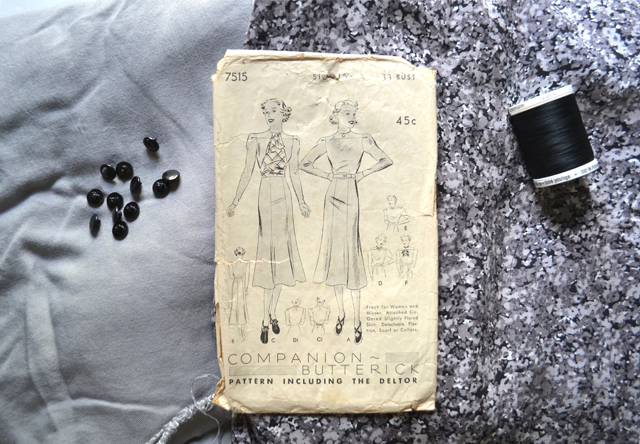 I measured myself again and included different skirt lengths to coordinate with the different decades I like to sew for, particularly the 30s and 40s this season. This makes it a lot faster to adjust patterns as I go if I just reference this drawing instead of having to check with a measuring tape every time. 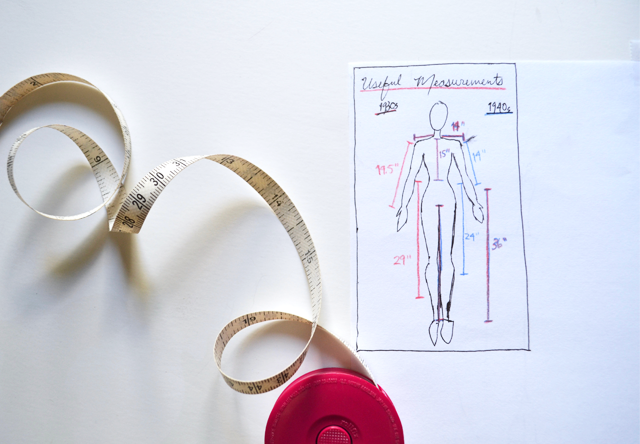 If you aren't sure on some harder-to-decide measurements like skirt and sleeve length, you can measure some garments that fit you well already. 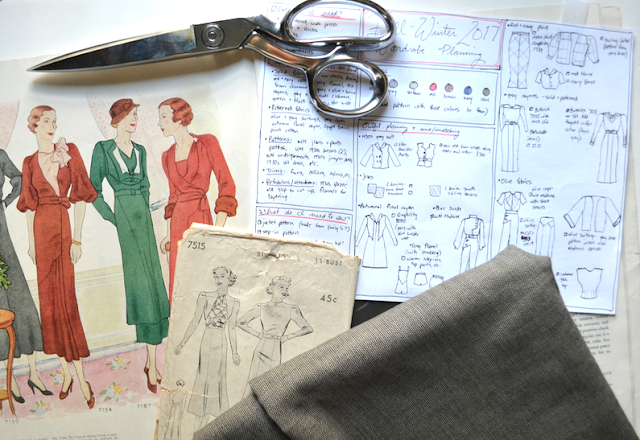 I love the length of this 1930s dress and this 1940s dress, so I put those on the drawing for future reference. And I'm proud to announce, I've already made my first item off the list! I'll be sharing it here soon. Stay tuned! Are you planning for the upcoming season's wardrobe changes? How do you choose what to make or buy? 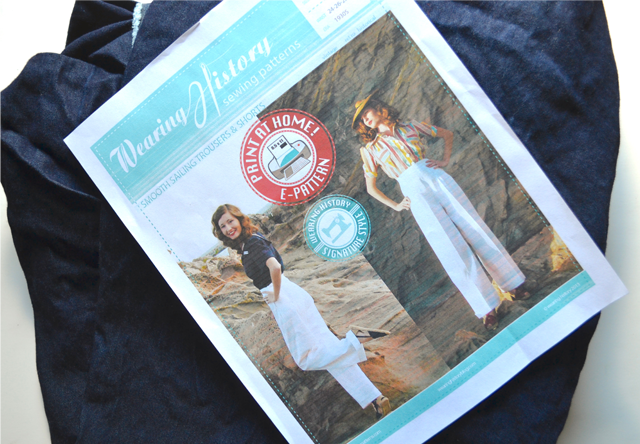 I have a stash of vintage and current patterns and hoarded fabric bought at drastic discount/or exotic locale before deciding what to make. Matching the pattern with the fabric so as not to waste expensive/unavailable fabric is problematic. I am inspired by international trends such as the fashion week going on right now in NY and London. I like a variety of styles 1920s to 70s and current and can't make up my mind. The next project may be a work-appropriate modern or 70's floral tana lawn blouse with ruffles or a 30's crepe/georgette/crepe de chine blouse with drapey sleeves. Those sound like great ideas! I've also taken to taping a small piece of paper with the measurements needed to my crafting table in the corner. Easy to reference, and since it's taped down, I can't lose it. Also, I see your flannel undies, but don't forget long underwear and mid-length underwear like union suits! You can knit them too -- for extra extra cozy. It's an easy way to extend the use of a fall or spring dress. In the winter, I LIVE in knitted tights, fleece lined tights (so cozy! ), and long underwear. My other secret trick is that I always wear a tank top next to my skin. I can wash them on hot and bleach if necessary, but it keeps my dresses and sweaters cleaner for longer, and I can get more wears out of them before needing to wash.
Ooo, the waist-to-hip measurement is also a good idea! I've had to adjust that (or just the curve of the hip) on a couple patterns as well. And yes, long underwear and mid-length is also great! I currently have a lot of fleece lined tights, so I was feeling pretty confident in that area. I'd LOVE to knit some, but I'm not sure I can knit them in time for this season. I'm pondering sewing some up out of a knit fabric. I wear a lot of berets, too. I also used to walk to work, and I wrapped a lot of scarves around my head babushka-style. I didn't care! There are a lot of knit 1940s headbands and turbans that you could make out of chunky yarn. 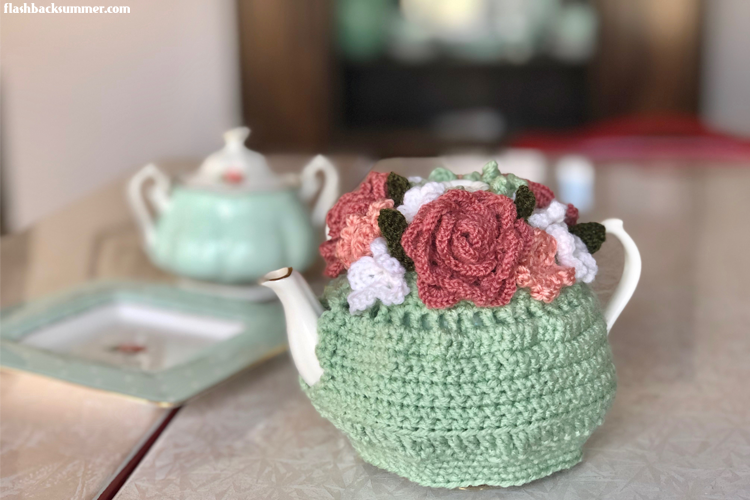 They're warm and pretty quick to make! Ooh babushka style is something I forget about! Good call -- thanks! This is brilliant and far more organised than my approach! I was pretty much in the same boat last winter, although we were lucky enough to have a mild one, and am determined this year I will be toasty and warm. I have four main areas to focus on, long sleeve dresses (as in my last post), long sleeve blouses, crocheted jumpers and warm jackets. These are the four areas that are severely lacking in my wardrobe. 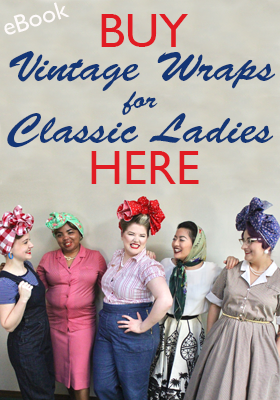 They'll all be in late 1920s - early 1940s styles and will mix and match with what I already have. Like you, I'm determined to use patterns and fabrics I already have and use patterns more than once. It's time I made use of these rather than keep buying things on a whim. Very organised approach! I'm impressed :) I moved back to Norway some seven years ago and it took me quite a few years to build up a suitable winter wardrobe. I lived in Ireland for 6 years before moving to Lillehammer, and the difference in winter climate is unbelievable. It has to be experienced. Before moving to Ireland I lived at the coast of Norway, and even if it got cold in winter it still didn't get as bad as Lillehammer ( in Tromsø it never got worse than -15 celcius, in Lillehammer we've had -35 celcius...), so there were a lot of things I needed. Thing is at first I thought I was just unaccustomed to the cold and I would adjust, so for the first two years it didn't occur to me that I needed to get things such as woolen undies, longjohns, a long down coat, warm knitted jumpers etc. I actually thought I could manage with what I already had, boy was I wrong! I think this is the first autumn since I moved here I know I have all I need. I've bought up gentlemen's suit trousers, the really heavy, thick wool ones at flea markets, bought merino wool jersey fabric and sewn long sleeved jumper undies, and bought wool long johns ans well as thick thermal tights. 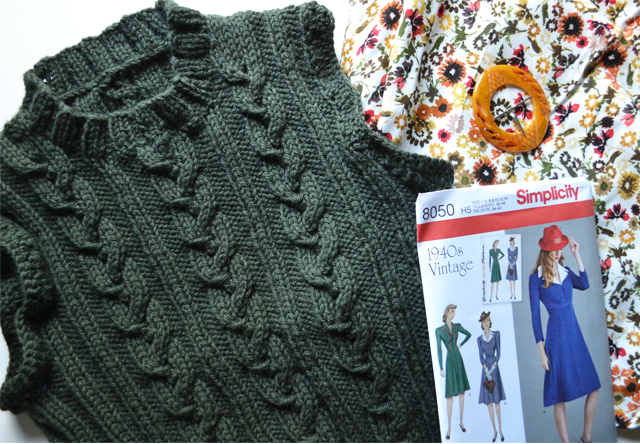 I've also spent the better part of the last year knitting warm and pretty jumpers (no less than 4 jumpers and 2 cardigans), which was the last gaping hole in my winter wardrobe. What I need now is blouses for work, and I'm trying to combine sewing them up with destashing. I know it would be much quicker if I reused patterns, but it's so dull. Especially since I have so many lovely blouse patterns from the 30ies and 40ies. Wow, that's quite the switch indeed!!! It sounds like you have made so many useful things for the upcoming winter and have worked ahead brilliantly! Like, seriously, I'm really impressed! This is such a great idea to really create a cohesive plan of action! I can't wait to see the dress you make out of that orange, yellow and green rayon- it is beautiful! Inspiring, fantastic plan. 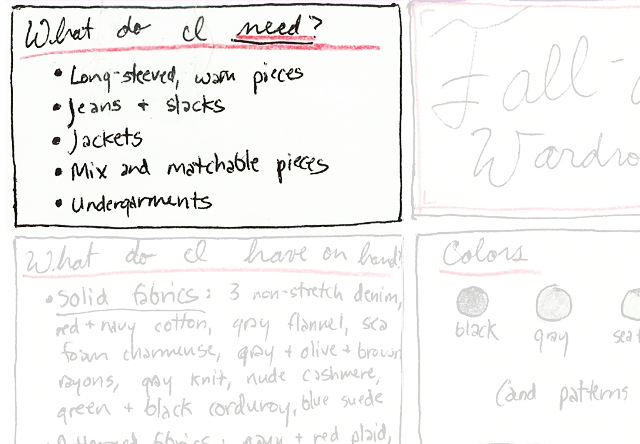 I really, really like how prepared you are and hope that everything goes awesomely for you with your sewing plans. Love this! Thank you so much. I just started putting together a vintage wardrobe over the summer with lots of skirts and short sleeve dresses. I recently realized that I need to throw some cold weather items on my to-do list as well! I recently made that Simplicity 8050 dress and loved it. That little inset seam at the hips was tricky. Also, the top of the row of buttons hit REALLY low on me. Like scandalously low. I had made a muslin, but didn't pay attention to wear the buttons hit, so I didn't realize it until I had already finished the garment. I ended up adding two snaps above the buttons to hide the girls, but when I make this again, I will make that adjustment ahead of time. Looking forward to seeing your finished product! Here's a pic so you can see what it looks like made up. My husband and I dressed up as Agent Carter and Captain America. This is a very impressive amount of organisation. 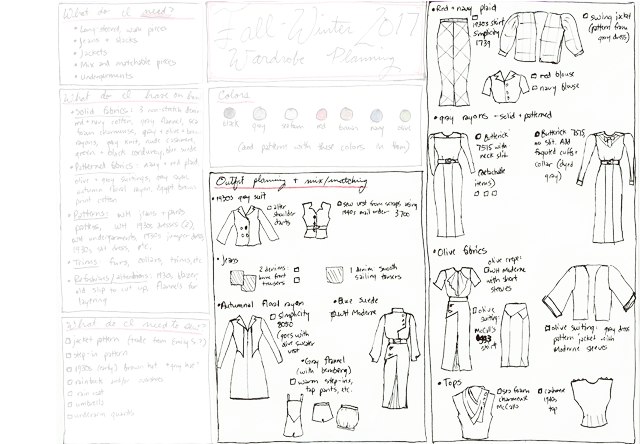 I have tried to be organised about my upcoming season wardrobes before, and I was good at the planning stage, bad at making it happen! Healthy Living: Is Pyrex Poison?